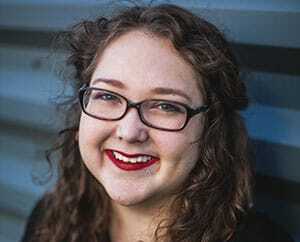 I’m excited to introduce Jennifer Kent with an absolutely gorgeous travel guide to the Okanagan Valley in Canada. In 2006 my mom moved to the Okanagan Valley (in British Columbia, Canada) and the following July we came out for a visit. As we were touring through the region, we fell so in love with the area that we moved here 8 months later. Now, many years later, we have still not even come close to finding all that the Okanagan has to offer and are still exploring every chance we get. From the North Okanagan, where I live, to the southernmost point at the U.S. border (from Sicamous to Osoyoos), is roughly 155 mi (250 km) and takes about 3.5 to 4 hours to drive if there was no traffic (there is pretty much always traffic in the valley, especially in the summer season). 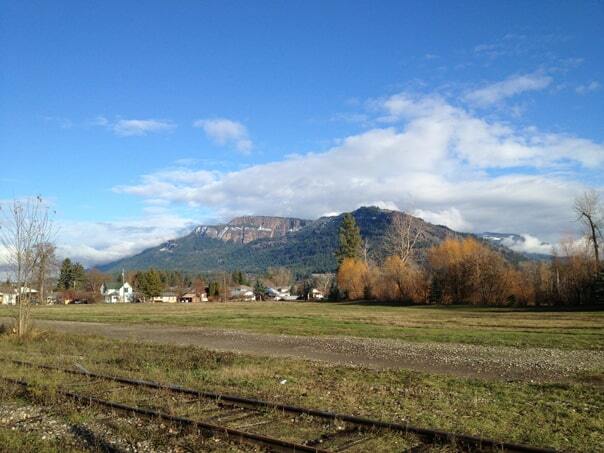 The North Okanagan also includes the Shuswap Region, which is located to the west around Shuswap Lake (Sicamous to Salmon Arm). The region is also home to many First Nations Peoples who have lived here for thousands and thousands of years. Their culture and history is deeply integrated everywhere in the valley. You can see, learn and experience the richness in many of the shops, restaurants, tours, and adventures found in the valley. 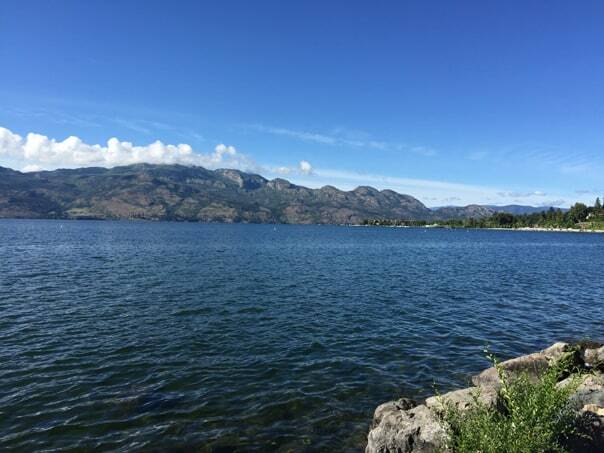 Click through for more of Jennifer’s Okanagan Valley Travel Guide! 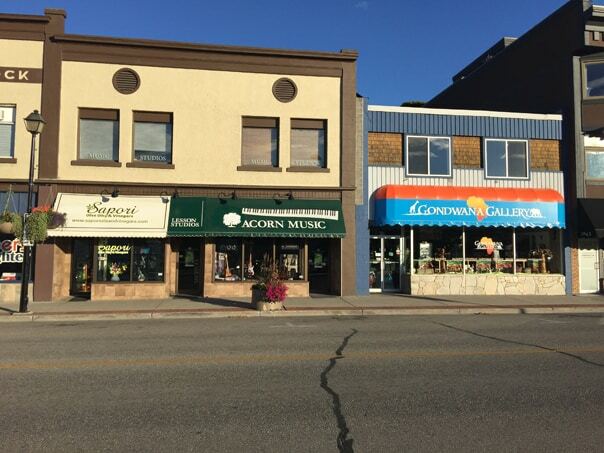 While we have all of the big box stores and chain restaurants here, it is not hard to find the many small eclectic shops (sometimes literally located on the side of the road) and one-of-a-kind dining experiences that make the Okanagan such a gem. Agriculture has strong roots in the valley and you will find numerous produce farms, berry farms, and orchards. Some offer tours and many sell their wares in roadside stands or small shops on their property. There are also a great variety of vineyards and wineries, with tours and tastings easily accessed all along the valley. Snowshoe trail blaze (sign) on an snowshoe trail in the Larch Hills. There is no shortage of things to do and see in the valley. If it can be done on the water, you will likely find it somewhere here in the Okanagan. There are 9 major lakes that you can enjoy as well as a couple of rivers and smaller, less touristy lakes in the region. Hiking and biking trails vein the entire valley and range in difficulty from easy (paved and flat) to requiring extreme skill (narrow, windy trails with loose debris and steep elevation climbs). 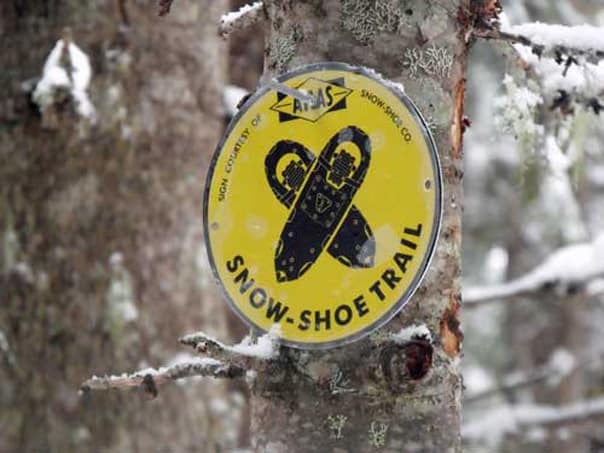 In the winter these same trails are then used for downhill skiing, cross-country skiing or snowshoeing. 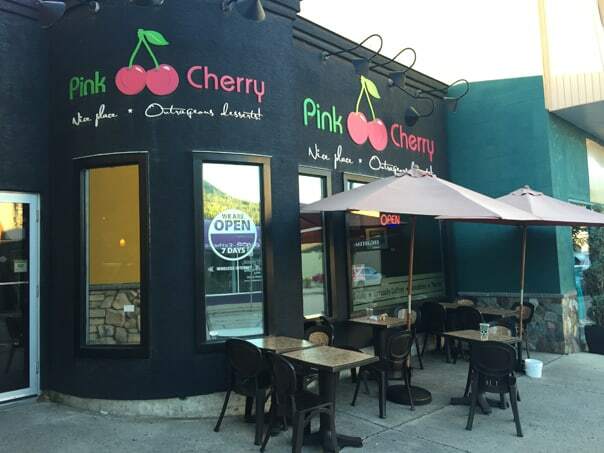 Pink Cherry: This little downtown café in Salmon Arm is a great place to grab an authentic, handmade gelato on a hot day, sit with friends and enjoy a specialty coffee, or eat a delicious, health conscious meal. One of my favorites is their unique version of the Chicken Quesadilla. The café has a relaxing atmosphere and features wi-fi and a menu with gluten and dairy- free items. 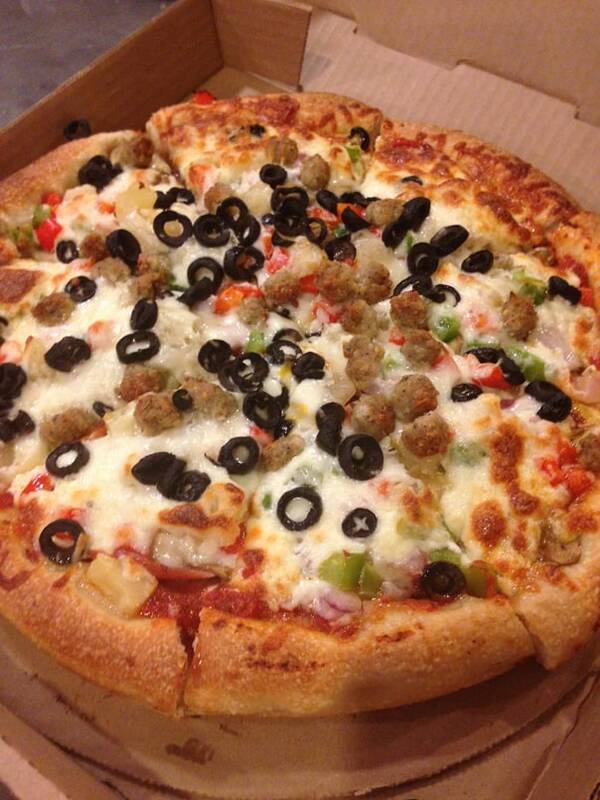 Mel’s Pizza: Located on Main Street in Enderby, Mel’s serves the best pizza in the Okanagan. Whether you prefer your pizza covered in meats and cheeses or are looking for a gluten and dairy-free pizza option, the amazing staff at Mel’s will customize your pizza to suit your taste. If you aren’t sure what to try, I recommend the Buffalo Chicken pizza. If pizza isn’t your thing, you can also choose from salads, pastas, donairs and fresh baking such as breads, buns and cookies. There is limited seating for eating but a comfy couch to lounge on while you wait for your order. Mel’s also offers delivery in the area. Sutherland’s Bakery: While you can get gas, baked goods, and some grocery items at this one-stop shop in Enderby, it is the ice cream that is worth coming for. They have dozens of flavors as well as soft serve, for those that prefer it. Very generous serving sizes for the price. Unless you want a huge mound of ice cream, go for the single scoop. Little Tex Restaurant: Don’t let its location and outside appearance fool you. This south-western restaurant in Vernon has a fun atmosphere and serves mouth-watering enchiladas, which come in generous serving sizes. I would suggest you go early or make reservations, especially on the weekends. Raudz Regional Table: Located in Downtown Kelowna, this trendy eatery serves delicious food and trendy cocktails in a chic atmosphere. What makes this restaurant awesome is its amazing service, open concept kitchen, and fresh, healthy meals made from locally purchased ingredients. They don’t take reservations, so get there early. 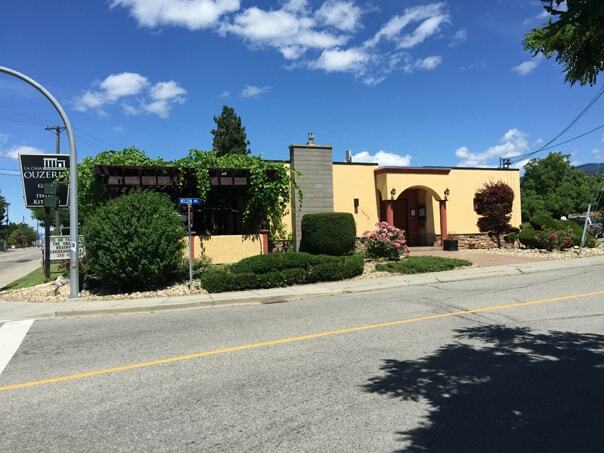 La Casa Ouzeria Greek & Italian Kitchen: Just minutes away from Skaha Lake Park Beach in Penticton, this restaurant is a great place to escape to after a day on the water. The souvlaki is always a delicious choice as you can choose from chicken, beef or lamb kebobs. Reservations are a good idea in the evening, especially during the summer season. Larch Hills Winery: This incredibly scenic North Okanagan vineyard and winery is a pioneer of cold climate grape growing and produces several great white, rose and red wines, which differ in flavor from warmer climate wines. A 15-minute drive from Salmon Arm, I would suggest calling ahead to book a tour or sampling time. 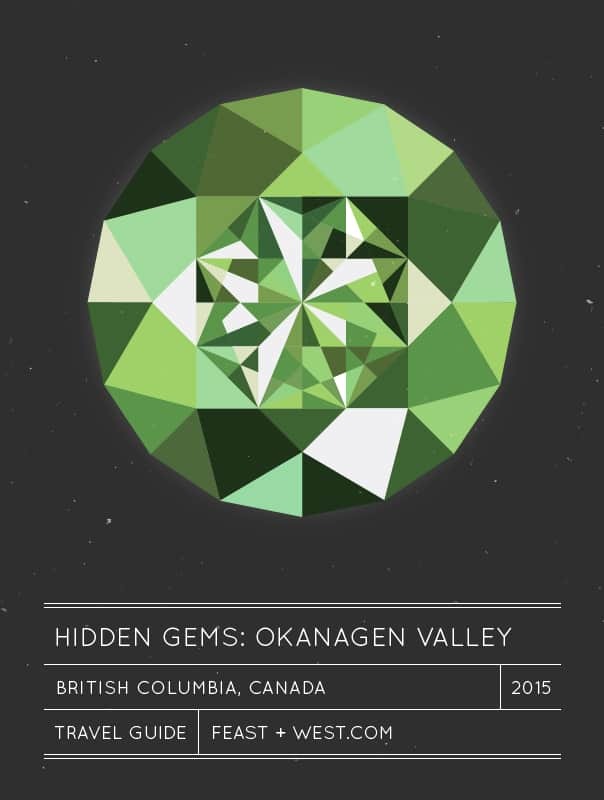 Okanagan Spirits: If wine isn’t your thing, not to worry. Okanagan Spirits is a craft distillery that produces all manner of spirits including Vodka, Gin, (real) Absinthe, and numerous fruit brandies and liquors. It is worth the time to tour their facilities and sample your favorite spirits. They have two locations now, the original in Vernon and the newer facility in Kelowna. Kalala Organic Estate Winery: If organic is your thing, then you will want to check out this vineyard and winery. 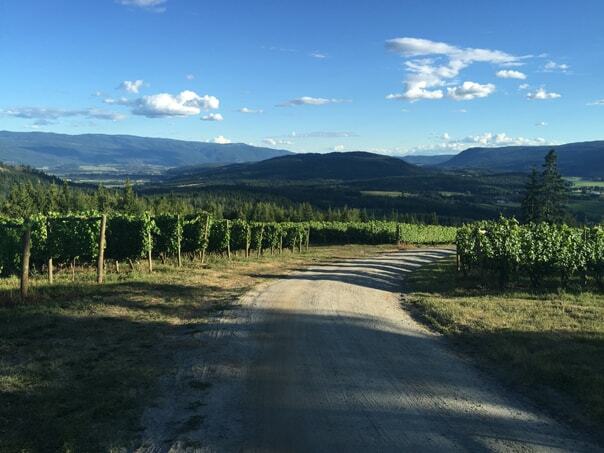 Certified organic since 2010, this winery is located on the Upper Bench in West Kelowna (Westbank) and focuses on minimal handling through the winemaking process. 8th Generation Vineyards: It is all about family and tradition at this boutique winery. Wine making runs in the Schales bloodline with over 225 years of experience in winemaking and grape growing. Make sure you try the Confidence Frizzante. Desert Hills Estate Winery: This boutique winery is situated in some of the most ideal terroir in the Okanagan, just outside of Oliver on the Black Sage Bench. The award winning, family run winery is home to several must try vintages including their Cabernet Sauvignons and Cabernet Francs. Okanagan Wine Festivals: Taste the finest wines the Okanagan region produces during the 4 annual Okanagan wine festivals. There is a festival for each season – spring, summer, fall and winter. The spring and fall festivals have numerous events, all held at different locations throughout the valley. Many of the events happen at the local wineries themselves and offer you a great chance to see the process in person and speak with the winemakers. Unlike the spring and fall festivals, the summer and winter festivals are held in a central location with the summer event at Silver Star Resort (Vernon) and the winter event at Sun Peaks Resort (Kamloops). The events held at these festivals not only allow you to sample award winning vintages, but also to enjoy the foods that they are best paired with. If you like ice wines, make sure you attend the winter festival. 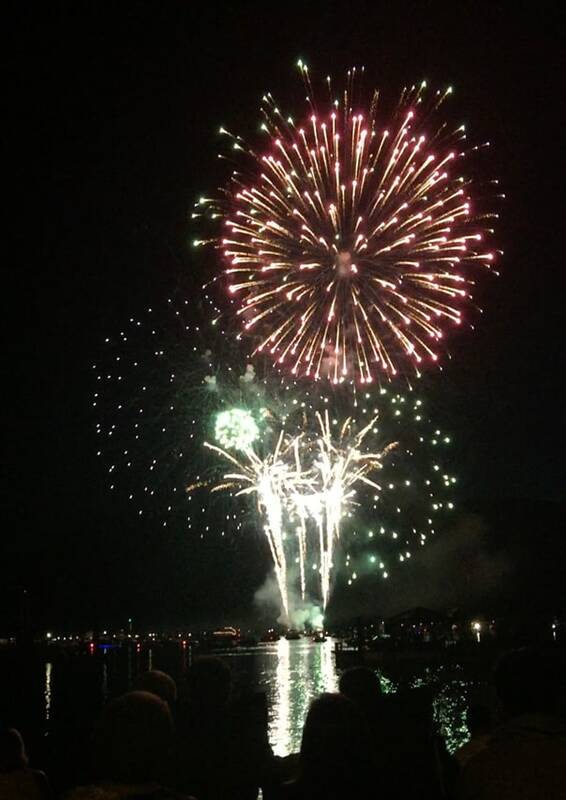 Canada Day Fireworks: Best fireworks in the Okanagan! Even if the region has a fire ban, these fireworks go at dusk every year, as they are done from a barge on Shuswap Lake just off Beach Park in Sicamous. You want to get there just after suppertime to get a great spot on the beach, and can pass the time till the show in the water or relaxing on the beach listening to the live band play. Optionally you can watch the fireworks from the water on a boat, just be sure to get your spot early and be prepared for a long wait to get your boat docked after the fireworks. 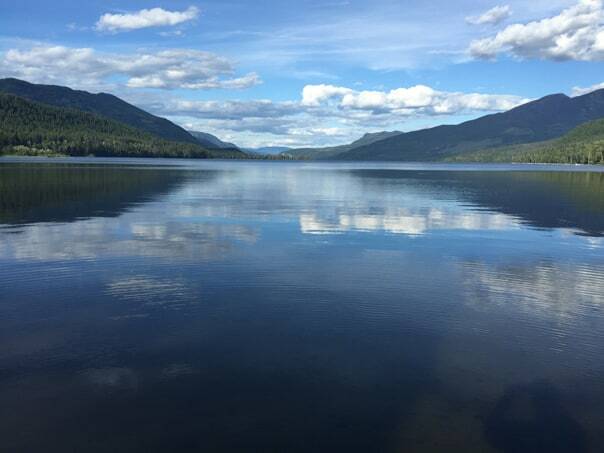 The Shuswap Lake: While houseboating is a tourist favorite during the heat of the summer, I will let you in on a little known secret. The best time to rent a houseboat is in the off-season. Not only do you save a load of money and not have to battle the masses, but spring and fall are some of the most scenic times on Shuswap Lake. 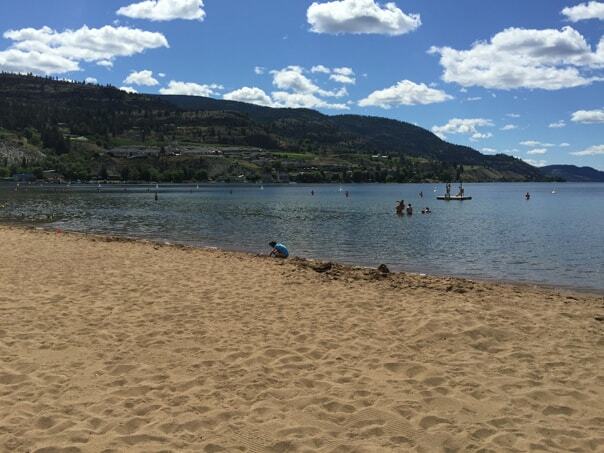 The Shuswap River: A great way to beat the heat in the summer is tubing down the Shuswap River. While there are a number of places you can put in and get out, the best float is between Belvedere Park and Tuey Park (also known by locals as Waterwheel Park). 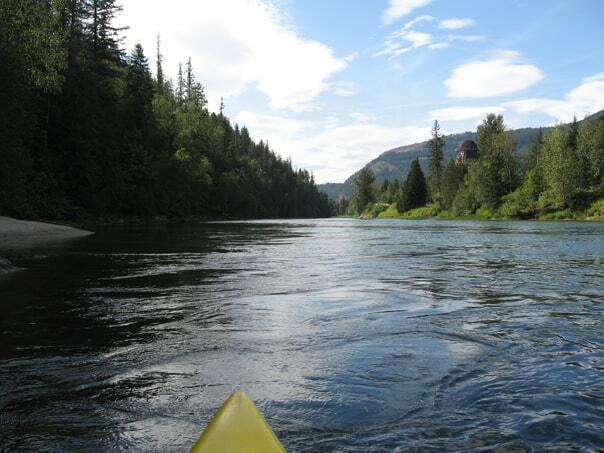 It is about an hour or less float in mid summer, right within the town limits of Enderby. Be warned that many of the floats times if you put in above Belvedere Park can be up to 8 or 10 hours, depending on the location and time of year. Starlight Drive-In: No trip to the Okanagan is complete without taking in North America’s largest drive-in screen. A fantastic way to finish a hot summer day, the drive-in is located just outside of Enderby. You want to get there when the gates open to secure a great spot for the show, particularly on weekends. You get two movies for the price of one and the first movie starts at sunset. Funtastic Sport and Music Festival: This annual co-ed slo-pitch tournament and music festival in Vernon is all about fun. The more awesome your costumes, the better prizes you can win. Choose between the guaranteed 4 Game and guaranteed 6 Game tournaments. Rock bands that have hit the music stage include Honeymoon Suite, Theory of a Deadman, Big Wreck, Bif Naked and Moist. Bridlewood Riding Centre: A fantastic way to enjoy the sights of the gorgeous Lake Country region between Vernon and Kelowna. The trail riding tours are great for all riding abilities and they keep tour groups small. Oyama Zipline Forest Adventure: If you are looking for thrills and speed, then you need to try this zipline adventure in Oyama! The 3-hour course varies from section to section and includes double racing lines. Unlike some zipline courses, this one was built so that people of all sizes can enjoy it. Kelowna Actor’s Studio: Enjoy an exceptional theatre experience set in an intimate atmosphere in Downtown Kelowna. The talented cast performs a number of different shows each year ranging from dramatic, to comedic to family friendly. While you can simply purchase seats to the shows, this theatre experience would not be complete without the full dinner theatre experience. They serve gourmet faire related to the theme of the current show, chosen a la cart that evening. Book online as early in advance as possible to get your choice of seats. I prefer the booth seating best. Oktoberfest: If you love beer and food, then you will not want to miss this festival. The night is filled with fantastic beers, delicious food and traditional German music during this one evening festival in October. It has grown in size each year since it was started in Penticton in 2010. Nk’Mip Desert Cultural Centre: Explore Canada’s pocket desert with its unique terrain, culture and history at this impressive cultural center in Osoyoos. You can hike the 1.25 mi (2 km) trail, wander the gallery or participate in their active experiences such as salmon fishing and rappelling down a 65-foot (20 m) cliff face. Gondwana Gallery: Situated on Lakeshore Drive in Salmon Arm, this little shop is a great place to find unique imported gifts, home décor and accessories. They also carry a variety of percussion instruments including djembe drums. 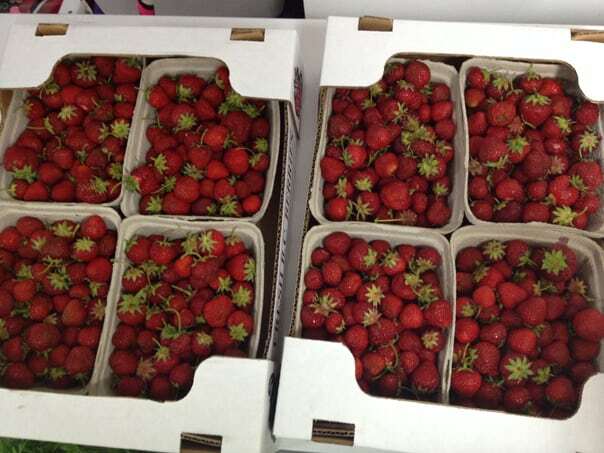 DeMilles Farm Market: Grab your fresh produce and meats from this year-round Salmon Arm market. In the summer and early fall you can wander the farm area where they have a petting zoo, corn maze and ice cream stand. The Falling Coconut: A great place to find eclectic indoor and outdoor home décor imported from Southeast Asia. You can also purchase a variety of jewelry, clothing and giftware items from here. Open from April to November in Enderby, if you get hot while shopping, you can always pause and enjoy an old-fashioned ice cream cone. Sapori Oils and Vinegars: Yes there is an entire shop dedicated to flavored oils and vinegars. In fact, they are doing so well that they now have two locations with the original store in Armstrong and their new shop in Salmon Arm. Don’t worry if you are not sure how to use them, they have pamphlets that share some of the best ways they know to use each. My absolute favorite is the Chocolate Raspberry Vinegar. It is great on salads, ice cream, brownies and cheesecake, just to name a few. Okanagan Farmer’s Markets: Every week you can buy fresh (and often organic) fruits and vegetables, homemade breads and baking, locally raised meats, eggs and honey, and handmade art, chocolate, crafts and gifts at the different markets located at each of the communities in the Okanagan valley. These markets are most often located outdoors during the spring, summer and fall months (some continue over the winter at indoor locations). Canyon Clothing: This is a great place to find that perfect outfit for a special night out. They carry a number of designer labels as well as clothes to fit curvier ladies. The service is amazing and the change rooms are spacious in this downtown Vernon boutique. Wearabouts: If you are planning on doing any trekking or adventuring while in the area, you may need to purchase some solid activewear. Whether you need hiking shoes, yoga pants, a backpack or a “Buff” to keep your hair out of your face, you will find it here. They have a shop in both Vernon and Salmon Arm. Functional: An eclectic shop in downtown Kelowna that is home to a variety of unique accessories, gifts and home décor made by local artists. 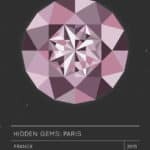 A great place to get customized art or personalized jewelry. Something Pretty Boutique: The small fashion boutique is ideally situated right on Front Street in Penticton. A great place to find both casual daywear or an outfit for a special night out. The shop also carries fashions in junior sizes for girls. Fantastic service. 85th Boutique: Find lady fashions, accessories and home décor at this funky boutique set in a little white house in Osoyoos. Beat the heat and find a fashionable hat or pair of sunglasses to wear here. 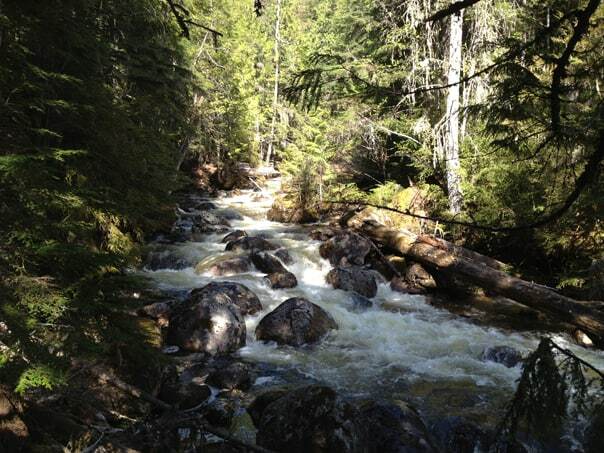 3 hours: Wells Grey Provincial Park – Truly spectaculars views to be found in this park including the dozen or so waterfalls you can hike to. 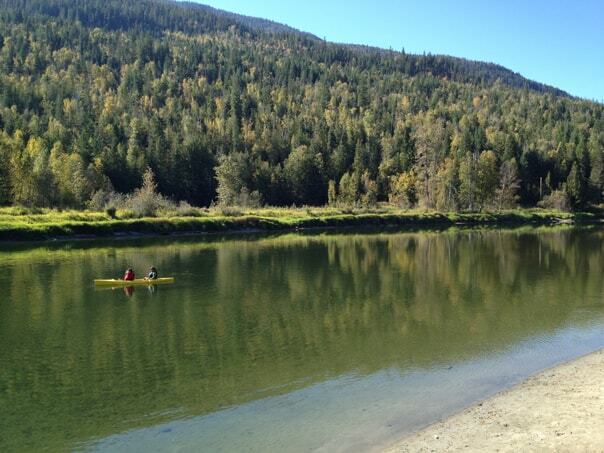 The park is also great for other activities such as camping, biking rafting, kayaking, canoeing, and fishing. 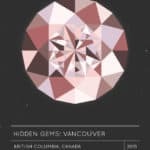 6 hours: Vancouver – This city has it all, fabulous sights, amazing shopping, and a fantastic nightlife. 7 hours: Vancouver Island – The ferry ride alone makes this trip worthwhile. Make sure you visit the west side of the island and stop at Long Beach. Some of the best surfing in Canada and soft, soft sand. 4 hours: Banff National Park – Stunning views and fantastic hikes in Canada’s oldest National Park set in Alberta’s Rocky Mountains. You will also find plenty of shopping and dining in the park in Banff town site and Lake Louise. 7 hours: Drumheller – Set in Alberta’s badlands, there is plenty to see and learn about dinosaurs in the Royal Tyrell Museum or hike the hoodoo formations just outside of town. 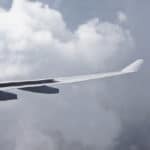 Jennifer Kent is a travel, social media and business ghostwriter based in Enderby, in British Columbia’s lovely Okanagan Valley Region. She spends her free time hiking and camping with her husband and daughter. Have you considered listing Lorenzo’s Cafe, just outside of Enderby in Ashton Creek, in your Gems as we have won the Tourism award twice with the Enderby Chamber of Commerce as well the Best Music Venue award 13 times in the Best Restaurant issue of Okanagan Life Magazine. 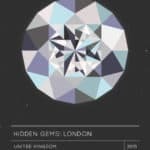 We are know for world class live music and a very unique atmosphere. It certainly is a Gem from what I have heard Lorne! I just haven’t had the chance to experience it myself yet, but is it top on my list to do. Thanks for adding it here, as hopefully readers will add it to their lists when in the Enderby area.